Which child doesn't love toys? Well, in our home with two boys ages 6 and 9 months, you know toys are a big deal. My oldest loves to take trips to the toy store with me. To him it is much more fun to go in person then for me to order gifts online. He particularly loves to lay out all of the items he is considering and slowly eliminate the toys until he decides which one he will take home. With Christmas fast approaching I am always looking for new items to tell my fabulous readers about. I was recently sent three very cool toys for my boys from ASTRA and the Your Neighborhood Toy Store Campaign. Two are for my older son and one for the baby. The New best toy list for 2013 makes shopping for toys even easier because there are winning toys that are selected from 650 experts and the choices are based on the the ability to promote open ended and creative play or a toys innovative design and features. Safety standards are also thought of in the process of choosing toys for this list. This year there were 21 toys chosen for children of all ages. Below I have featured three toys from this list but you can see the full list and take into consideration for this Christmas season. Please consider purchasing these toys locally as it is good for your communities economic stability and your community toy store may carry toys that are not found at the big box office toy stores! Through 11/8/13 log in to www.yourneighborhoodtoystore.org and enter to win FABULOUS prizes which include toys and even an all inclusive trip to Hard Rock Hotels in Mexico. You can learn more about this sweepstakes and more through The WhohooFactor on facebook as well as twitter. 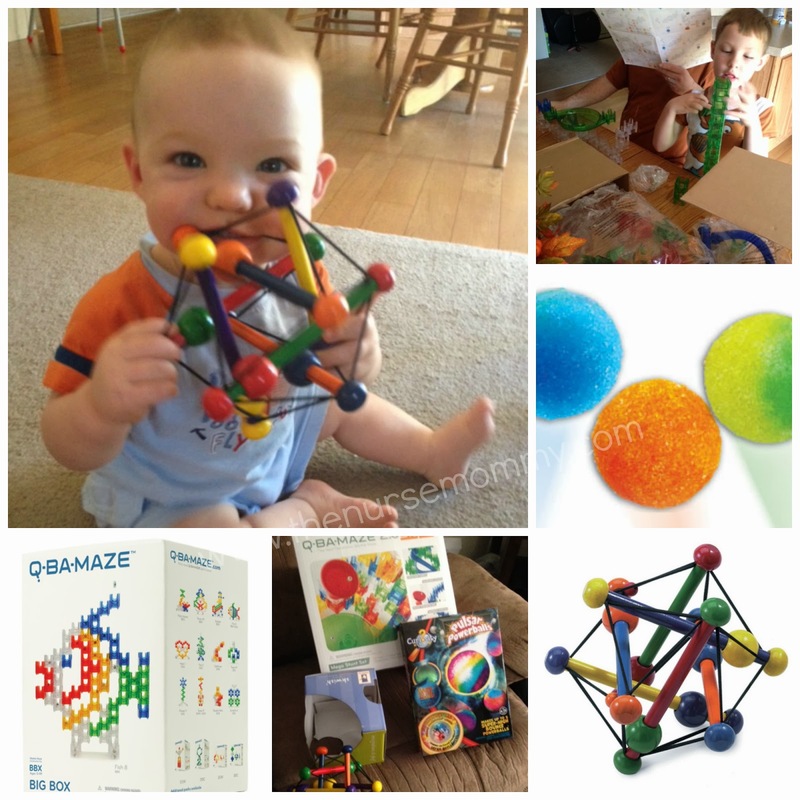 "Skwish appeals to baby’s visual and tactile curiosity, making this sophisticated toy a source of wonder and learning. This classic wooden toy has won the hearts of babies and parents everywhere, as well as numerous prestigious awards for its ingeniously simple design. Skwish Classic is made with replenish able rubberwood and features a water based, non-toxic paint finish." When my oldest saw baby brothers toy, he said wow, "we can play with that together, mommy!" It is truly unlike any baby you I have seen. 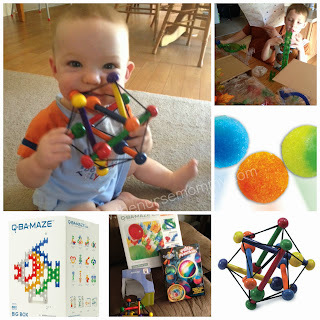 The geometric shape, and the ability to bend, stretch and manipulate the sphere makes it fun and interesting for both of my boys. It even has a little tinkle noise that keeps the little one interested. I often find him holding this with it smashed up against his face. He seems completely fascinated with it. "Every dinosaur, robot, flower, fish, sun or tower is a working marble maze. Inspire creative play by building the amazing marble run sculptures in the idea book or make up your own. The Big Box set includes high-quality red, yellow, green, blue and clear blocks." My oldest was completely stoked when he saw the marble maze. Though it took a bit of time to set up (you should probably set aside a few hours unless you are a puzzle genius), it was well worth it in the end. Perhaps my husband (who worked on this with my son) just lacks creativity to create his own super cool maze, and just tried to follow the instructions instead of letting his creative geniuses flow. In the end though, we had a fabulous creation in place and my son loved it. Being a very science minded little boy, he sat in awe watching the marbles in the maze and reassembling the kit to change directions! "With this cool Pulsar Powerballs Make Bouncy Balls Kit boys and girls can make 5 their own bouncy balls to experiment and play with. Pulsar Powerballs that kids can create with this unique craft kit bounce and soar to awesome heights." We also received a Pulsar Powerballs bouncy ball kit. This little kit is soo cool! It comes with molds and colored granules so you can customize your own bouncy balls. We had a blast making balls with everyone's favorite colors, and an even better time playing with the balls afterwards. The kit is very simple to use and to make the balls. We love anything creative and crafty and this fits both! It only takes a few minutes of placing the mold into water, and tada a fun and custom made bouncing ball! !